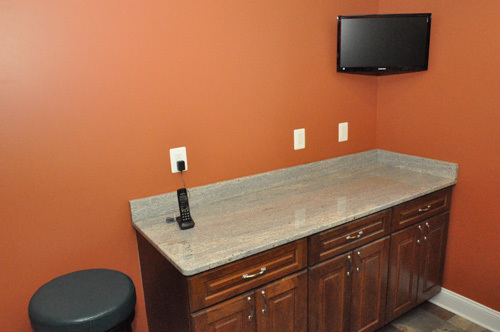 It’s time to close the book on another successful basement remodel. Final inspection has come and gone, and Joe and his crews are just adding the finishing touches. Mr. and Mrs. 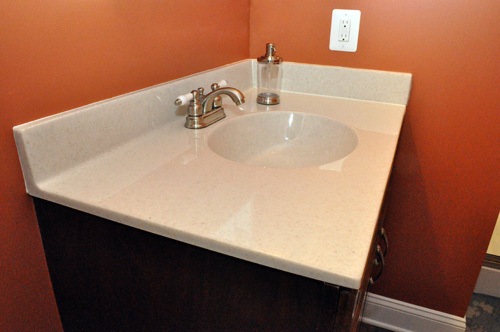 Homeowner are really pleased, and it’s been a terrific Pro-Follow with lots of great how-tos. Today’s article is a tour of the basement and recap of some of the major projects that took place. 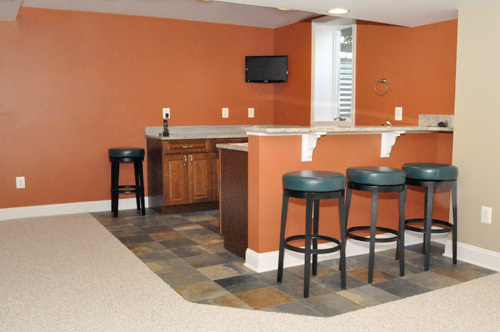 The wet bar is my favorite part of this basement, and I really like the choice of colors and materials. If you remember, Jim and Rich from Diamond Tile handled laying all the tile in the bar and bathroom, and they shared exactly How to Grout Tile. 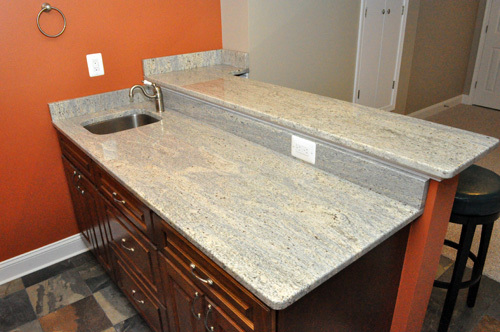 Joe took care of leveling all the base cabinets, and we got a great look at how the granite countertops were installed. The entire basement is wired with recessed lights, and I was able to spend time with Russel, a master electrician and owner of ETC Electric to show you How to Install New Work Recessed Lighting. I didn’t focus too much on the progress in the bathroom except to show the rough-in plumbing with the guys from Drain Relief. As you can see it’s a full bathroom, and the biggest challenge was rerouting the plumbing through the concrete subfloor. 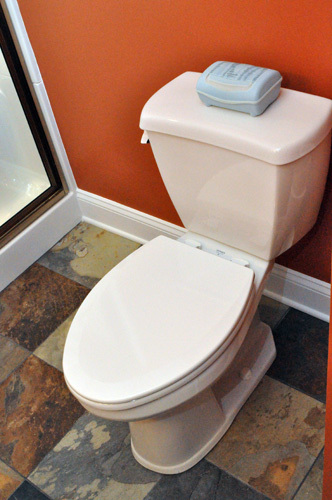 If you’re looking for more info on bathrooms, check out this bathroom remodel or this Project Guide for Installing a Toilet (like a Pro). 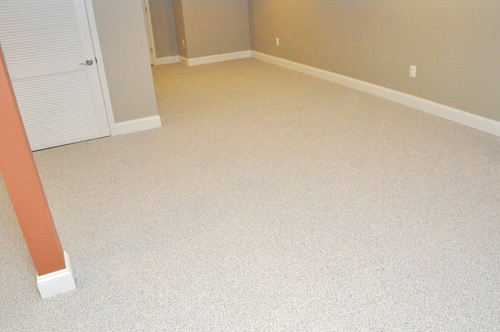 Except for the tile around the bar and in the bathroom, the entire basement is floored with berber carpet, and it was awesome to learn How to Install Carpet. 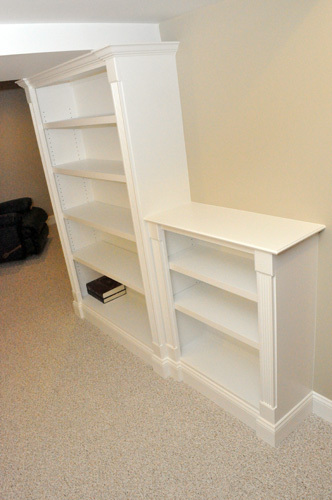 Joe built these custom bookshelves. They were one of the last pieces to go in, and they look amazing. If you or someone you know is looking for a contractor in the greater Baltimore area, I highly recommend you give Joe Bianco a call (info here). These Pro-Follows show the professionalism and attention to detail that Joe brings to every job, and you’ll thrilled with the finished product. Great way to bring the steps all together in one place. I’ll be bookmarking this one for future reference. Thanks Ethan and team. Love this space. I bet the homeowners will spend hours down here. I’d love to see the basement after they furnish it. Is that a possibility? Ethan, you are killing it with these pro-follows. Another very complete guide. Keep following Joe, he does good work (and has a clutch of quality subs too). The project turned out great. 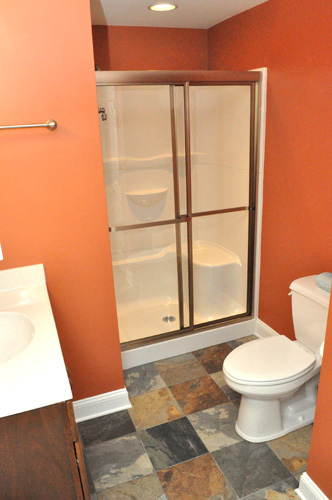 I think my favorite part is the autumn-colored tiles in the bathroom. I could never really get a full idea of the full size of the room until I saw the 4th picture on this post. Nice big area, and I’m sure they’ll have a ton of fun with it. Looks like a great new space for the family to enjoy. I’m not a fan of the orange color, but maybe I’d like it if I saw it in person. 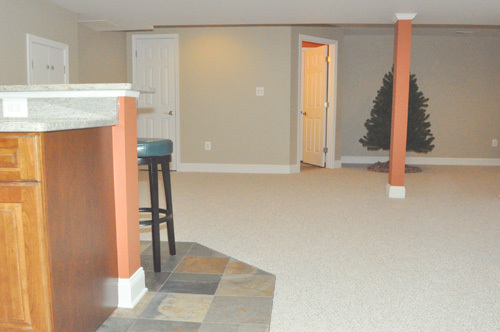 What a great looking basement. I love the wall colors. I didn’t take time to read word for word, I really should be doing housework right now, but I would love to know the colors used. Especially the orange. It’s so hard to find and orange that does “glow”.